It's been a huge change in my life since tossing my microwave. I would love to share my story with you so that you can create change either for yourself or family. 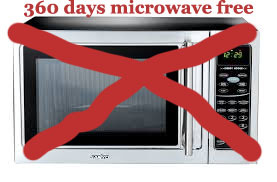 First Microwaves are bad bad bad!!! after reading blog after blog with information on how toxic microwaves can be, I decided to toss mine (gave it away). At first, it was hard. We were used to buying lot's, ok to be honest we were living off microwave meals. It was cheap and easy. However EXTREAMLY unhealthy, Given that we are both disabled it just made sense to buy these meals. The microwaveable meals like Hungry Man are loaded with sodium and lots of stuff that you wouldn't feed your child or even your dog if you knew. We switched over to a toaster oven. Our lives have changed. The way we shop has changed. We started buying more healthy options. No more microwave meals and more fruit and vegetables and yogurt. Creating meals at home instead of ready meals. In fact, we have both lost weight since switching over. It was hard to adjust at first but within a month we had it down and never looked back. This is something that i need to do for my family.. Seeing someone else doing it is enough for me to start making changes.